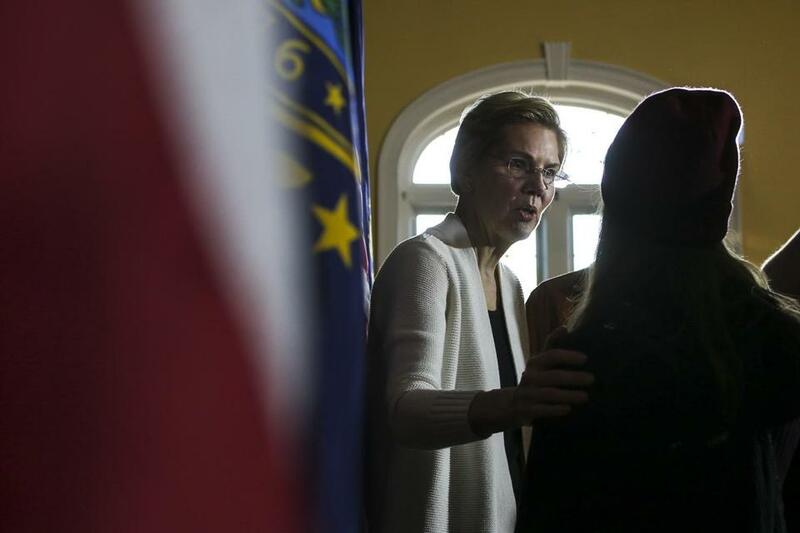 Senator Elizabeth Warren spoke to supporters Saturday during an event in Dover, N.H. New Hampshire officials fret that the first-in-the-nation primary could be losing its influence. For 100 years, New Hampshire’s primary has fashioned itself as a gauntlet for wannabe leaders of the free world, putting candidates through their paces in intimate coffee shops, house parties, and town hall meetings intended to flesh out who has the mettle to lead the party and, perhaps, the nation. But instead of celebrating this milestone — scheduled to take place one year from Monday — the state’s political pooh-bahs are expressing unprecedented anxiety. While the state is on track to host the first presidential primary in 2020, it might be less relevant than ever. The reason for the panic? A perfect storm of factors, including the primary calendar, an increasingly nationalized campaign, and the expected left-wing clash between two of the party’s leading candidates who hail from neighboring states. Sure, New Hampshire’s dominance has been challenged before by an ever-shifting primary calendar, or another state threatening to hold a similar contest earlier in the cycle. But this time it’s not what comes before New Hampshire but what comes after it that has worried local insiders. Just three weeks after the New Hampshire primary, nine delegate-rich states — including California, Texas, and Massachusetts — will have primaries on March 3. Top presidential candidates are expected to invest millions in television and campaigns in these states, which means New Hampshire could basically amount to an opening act before the big show. What’s more, new laws that allow for early voting mean someone in Concord, Calif., will be able to vote a week before someone in Concord, N.H.
(One major caveat: New Hampshire Secretary of State Bill Gardner has not set the date for the New Hampshire primary, and under state law, he can put it on the calendar as early as necessary to preserve its front-runner status). The shifts in the primary calendar will force candidates to evaluate how much and often they want to play in New Hampshire, said Nick Baldick, who ran the state primary campaigns for Bill Clinton and Al Gore and served as national campaign manager for John Edwards in 2004. “The calendar changes are big factor this year as campaigns map out their strategies,” Baldick said. What’s more, Democratic candidates — who could number as many as 20 in the field — will be relying more on low-dollar re curring donations from supporters. This means candidates will put a premium on getting national media coverage to appeal to the largest possible swath of donors. “The automatic low-dollar donations will mean that there will be candidates who can stay in the race after doing badly in New Hampshire, where a decade ago they would have to drop out because they had no new money coming in,” said Robin Kolodny, a political science professor at Temple University in Philadelphia. Also on the horizon is the prospect of a regional grudge match between US Senator Elizabeth Warren of Massachusetts and US Senator Bernie Sanders of Vermont. For both pols, it’s a win-or-die situation: Seven out of eight Massachusetts candidates have won the next-door presidential primary, and Sanders — who has yet to announce his intentions for 2020 — would find it nearly impossible to recover politically after losing a primary that he won four years prior by more than 22 points. Indeed, a large field of lesser-known candidates may, in theory, believe that New Hampshire is a great equalizer because its small size and intimate politics give less-financed candidates a chance. But if Warren and Sanders each have unprecedented funds to spend, and state polls show them consistently in first or second place, it could overshadow whichever candidate successfully pulled into third or fourth place in a large field. None of this, however, has yet stopped the droves of candidates from coming to the state to campaign. On Monday, former representative John Delaney will open his New Hampshire campaign office — followed by visits in the same week from at least five other potential presidential hopefuls: Senator Kamala Harris of California, Senator Cory Booker of New Jersey, South Bend, Ind., Mayor Pete Buttigieg, former Colorado governor John Hickenlooper, and former Massachusetts governor Bill Weld. Last week, Senator Sherrod Brown, Warren, and entrepreneur Andrew Yang all criss-crossed the state. But few candidates were laying groundwork for a campaign last year — the kind of preparation work typically done by presidential hopefuls. Only Sanders made regular visits to the state, and Warren didn’t spend a dime on advertising for her reelection campaign on Boston television channels that reach two-thirds of New Hampshire — something John Kerry spent millions doing before he ran for president in 2004. Finally, Joe Biden, the front-runner in all national polls for the Democratic nomination, hasn’t been to the state in two years. Nor has former Texas representative Beto O’Rourke, who headed to New York last week to be interviewed by Oprah Winfrey. Despite all this, US Senator Jeanne Shaheen, who started in politics by working in the 1976 presidential primary for Jimmy Carter, sounded a more confident note about the state’s political dominance. “It’s critical to our electoral process and I don’t see that changing,” she said. James Pindell can be reached at james.pindell@globe.com. Follow him on Twitter @jamespindell or subscribe to his Ground Game newsletter on politics: http://pages.email.bostonglobe.com/GroundGameSignUp.